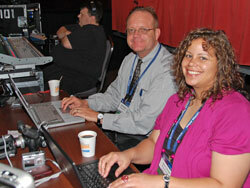 Cindy snapped a photo of Joanna Schroeder and me working in the main conference session room. RFA set up a great work station for us with internet access, power outlets and our own mult box to record speakers. Hint to all you conference organizers. It’s really great to provide media with a nice work station in the general conference room. Saves us having to run back and forth to the “media room.” Helps us to provide more immediate coverage of your event too. We’ve posted a lot of content on about a half dozen websites not counting things like Twitter feeds. I’m ready for a blogging break. Thank goodness for reception time. BTW. Here’s a link to my post on Twitter with a photo of Cindy and Joanna working.